Maricopa is growing again, and homebuilders are returning. In 2016, new single-family housing permits rose 70 percent compared to the previous year, said Martin Scribner, Development Services director for the city. Scribner estimates that 1,500 to 1,600 undeveloped lots – within developed subdivisions – have been sold from developers to homebuilders, based on what he has heard in the last four months. “How fast those develop is anybody’s guess,” Scribner said. The speed at which the empty lots are transformed into completed homes is up to the builders themselves, Scribner said. However, city planner Ryan Wozniak said competition between homebuilders to be first to the table is a good indication they are confident they can sell in Maricopa’s market. “We have had more model home complex applications this year than the previous two years that I’ve been here,” he added. 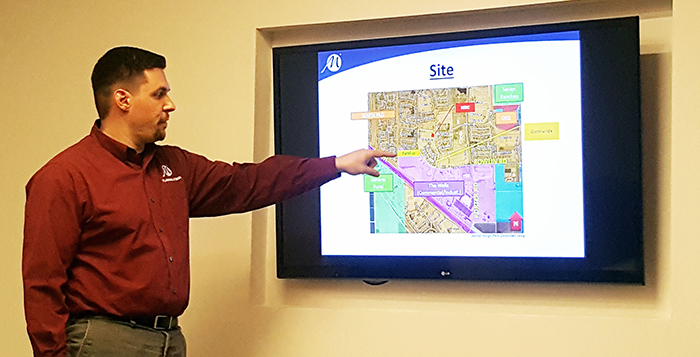 Scribner, who also acts as public hearing officer, approved two applications Wednesday for model home and sales office complexes brought forth by homebuilder D.R. Horton. The two complexes will be located in Santa Rosa Springs and Glennwilde subdivisions, which are among a few neighborhoods where building has been resurrected after the housing market took a hit during the recession. The Santa Rosa Springs complex will be located at 41834 W. Mano Place, and the Glennwilde site will be at 18501 N. Crestview Lane. The homebuilder purchased 373 empty lots in Santa Rosa Springs, and around 60 within Glennwilde. “The market seems like it’s turning around, so we’re happy that they are coming in with (these) model-home complex(es),” Wozniak said. Although growth is generally regarded as a sign of progress in cities, residents within both subdivisions expressed concerns during the public hearing officer meeting. Joanne Miller lives in Santa Rosa Springs and said she was worried about the increased traffic the nearly 400 new homes might cause. Currently, there is only one entrance to the subdivision, which is further complicated by external issues. One problem is the railroad crossing that intersects Porter Road and Maricopa-Casa Grande Highway. Miller said traffic can be delayed for as much as 25 minutes by Amtrak. Additionally, a wash on Porter south of the tracks has forced the road to close when flood waters rise after storms. Miller said she feared additional residential traffic, combined with the railroad and wash issues, could mean even longer traffic delays and obstructed access for emergency responders. Scribner said the city is aware of the issues and is working with a consultant to bring about solutions to that area. Traffic concerns were an issue for a resident in the Glennwilde subdivision too. Tena Dugan suggested proper signage be constructed to direct homebuyer traffic away from current residents living within the subdivision as much as possible. D.R. Horton Land Acquisition Manager Blake Davis said he didn’t think the homebuilder would have an issue with the suggestion. Scribner approved the application based on the homebuilder’s “willingness to look at the signage issue” as the process progresses. The homebuilder’s next step in that process is applying for building permits for the model home and sales office complexes.